Seoul, Aug 24 (IANS) Lee Jae-yong, the de facto head of Samsung, was on Thursday preparing to face a verdict in his corruption trial which could mean imprisonment and leave South Korea’s conglomerate without a leader. The Seoul Central District Court will deliver its verdict in the case on Friday. The prosecution is asking for a 12-year prison sentence for Lee’s alleged role in the so-called “Rasputin” corruption case, which led to the impeachment and imprisonment of former South Korean President Park Geun-hye, Efe news reported. Lee has so far pleaded not guilty in the case. Samsung group, which accounts for 20 per cent of the country’s GDP, has been led by Lee since 2014 after his father, Lee Kun-hee, suffered a heart attack. Lee is accused of transferring 43 billion won ($37.3 million) to foundations that were controlled by Choi Soon-sil, dubbed the “South Korean Rasputin” for her close friendship with Park Geun-hye. 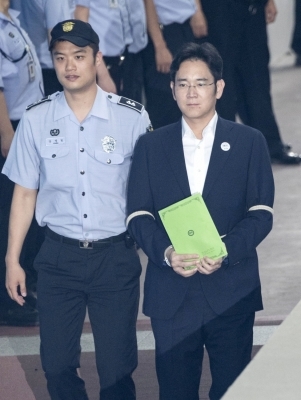 The payments were allegedly made to secure approval from a public pension fund in 2015 for the merger of two Samsung subsidiaries (one of which was part of the same fund) that reinforced the Lee family’s total control of the company.